This informative new book gives pre- and in-service teachers valuable help for assessing reading comprehension and meeting the needs of adolescent learners in the age of the Common Core State Standards. 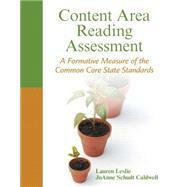 The Content Area Reading Assessment (CARA) is a formative, group-administered assessment of reading comprehension that teachers can use to determine students’ abilities to answer questions based on the Common Core State Standards (CCSS) for English Language Arts and Literacy (ELA) in Content Areas. CARA is comprised of literature, social studies, and science passages taken from representative textbooks at grades four through high school. Lauren Leslie founded and directed the Hartman Literacy and Learning Center and its predecessor at Marquette University for over 25 years. She has published over 25 research articles and she is the co-author (with JoAnne Caldwell) of the Qualitative Reading Inventory-5 and Intervention Strategies to Follow Informal Reading Inventory Assessment: So, what do I do now? She also co-authored (with JoAnne Caldwell) a chapter, “ Formal and Informal Measures of Reading Comprehension” in the Handbook of Research on Reading Comprehension (2009). She received the Albert J. Harris Award from the International Reading Association in 2001 for an article written with L. Allen, “Factors that predict success in an early literacy intervention program.” In 2006, she received the Mary Neville Bielefeld Award for Career Achievement for her contributions to teaching, research, and service, particularly the mentoring of women faculty and students. She is Professor Emerita at Marquette. JoAnne Schudt Caldwell is the co-author with Lauren Leslie of The Qualitative Reading Inventory – 5 and Intervention Strategies to Follow Informal Reading Inventory Assessment: So What Do I Do Now? She is the author of Reading Assessment: A Primer for Teachers and Coaches and Comprehension Assessment. She also co-authored Reading Problems: Assessment and Teaching Strategies with Joyce Jennings and Janet Lerner. She received her Ph.D. in Educational Psychology from Marquette University and is Professor Emerita at Cardinal Stritch University. She has published numerous articles as well as a chapter in Quality Literacy Instruction for Students with Autism Spectrum Disorders and a chapter in the Handbook of Research on Reading Comprehension with Lauren Leslie. She received the Outstanding Service Award from the Wisconsin State Reading Association (1996), the Wisconsin Teacher Educator of the Year Award (1997) and the Achievement Award from Marquette University School of Education (2005). She is Professor Emerita at Cardinal Stritch University.